The other day, I was sorting through my photo library. Over the past few years it has become a massive, sloppy repository of memories, and there are duplicates and thumbnails and extra shots from when I was trying to get the light just right... So I decided it was way past time to go through it all and get organized. As I was sifting through pictures, I found a lot of shots from the months just before I moved from San Francisco to London, including the one attached here. This was a really magical time in my life--I was on a major adventure, fueled by love and excitement about the future, surrounded by a wonderful group of friends who cheered me on as I ran toward the unknown. One of these friends was Breanna LeVine. 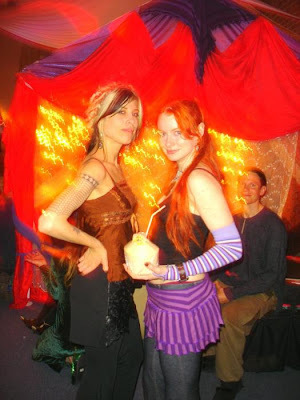 Having just looked at photos from parties we went to together, I was surprised to see yesterday that Dusty Paik had posted a picture of Rachel Brice and Breanna together at a soiree around New Year's in 2005. This very party was when I introduced James to Rachel and the madness of the scene I was reveling in, so I was amused by the coincidence that this was on someone else's mind as well, but I didn't think much of it. When I woke up this morning, I drowsily picked up my phone and saw that there were some new posts from people I follow on Twitter, including Stellamara. My heart skipped a beat--they had posted a song to "honor of the passing of our dear, sweet friend, Breanna LeVine." Yesterday's surprise photo posting was recast in a somber tone. It made sense in the worst way. The last time I saw Breanna was when she came to stay with me in Cambridge just after she came to vend at Glade in 2007. Before I moved to London two years before, Breanna and I went to dance classes and parties together, brewed up a few crazy plans together and just generally ran around like blithe young things in the thrall of life. It was awesome--we seemed to just stumble into one serendipitous situation after another. By 2007, things had shifted a bit. Her visit coincided with a fairly busy and stressful time in my life; I was absolutely broke, had just finished my second, hellish year of university against all odds, and was struggling to keep everything together. Unfortunately, she was in a really different headspace, and most of her visit was spent with us being frustrated with each other--she felt I had become cynical, and I felt that she was taking advantage of me at a time when I had little to offer. When we talked, we seemed perpetually at cross purposes, and it made me really sad; I'd been so thrilled to see her, but by the end I just felt trod upon. We weren't really in contact after that. It made me sad, and more than once I felt the urge to send an email or do something to try to regain the positive connection from before. But I didn't, and she didn't, and time went by... I saw the occasional blip on a social networking site about what she was up to, and would be happy to see her doing some cool new project, but that was the extent of our interaction. I've spent some time today trying to find out what happened to her, just trying to get some picture of the trajectory of my estranged friend. We have enough shared friends and acquaintances that the mourning of her passing is visible to me everywhere--I've seen so many pictures of Bre, songs posted in loving memory of her, heartbroken writings trying to make sense of her absence. My corner of cyberspace is festooned with remembrances of her, and it all feels so sad and alien. Tomorrow I will get on a flight to San Francisco, and it will be the first time that I'm there and she's not. Looking at photos the other day, I wondered if it would be a good idea for me to get in touch, see if we had grown together again and if the playground days of dance classes and funky parties could be resurrected once more. Her old number is still in the phone I use when I'm Stateside... The possibility is so tantalizingly there, but fictional. My heart and head just don't quite get it yet. Now, on my itinerary for San Francisco is some time to say goodbye to a friend who helped me leap across the Atlantic Ocean in pursuit of love and crazy dreams. I hope that somewhere out there, her spirit knows that I never stopped thinking of her, and that she will live on in my heart.